Dr. Dwyn Mounger, was an erudite, energetic and engaging personality with an impressive knowledge of religious history. His preaching was considered well organized, thorough, interesting, and varied; he told stories and gave analogies. He wrote and acted out sermons in verse. He grew up in Mississippi, the son of a Presbyterian minister who was a leader in the Mississippi civil rights movement in the 1960's. He was a world traveler; he led tours in Scotland, England, Ireland, the Netherlands, Switzerland, East Germany, Czechoslovakia, Hungary, Egypt, Israel, China, and France. He incorporated his experiences into his theology. He is an excellent writer. 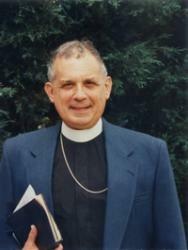 He is author of the words for Hymn #239 in the new church hymnal and of a sermon published in Harper & Row's collection of the best sermons of 1989. He and his wife Kay, an elementary school teacher, have a daughter Misty and son Mack.